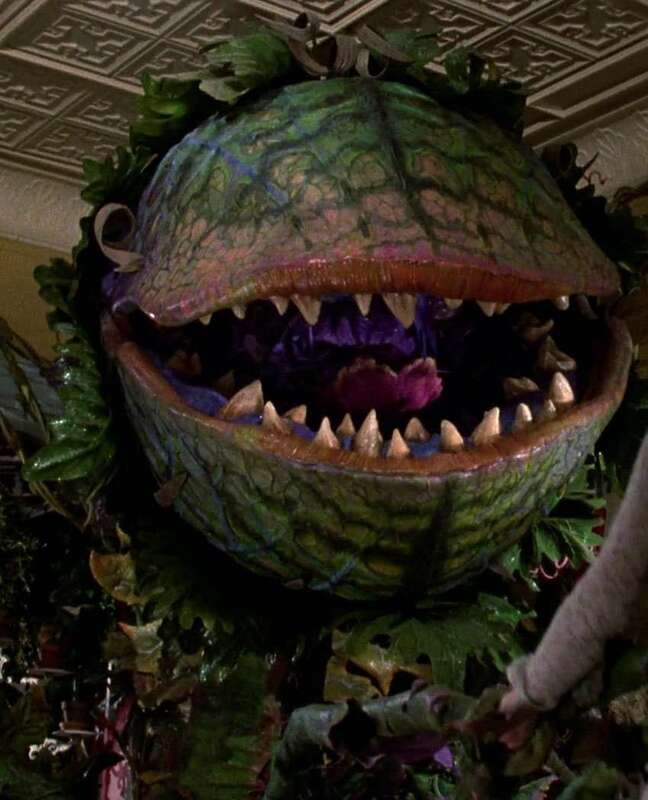 Butterworts are the carnivorous plant equivalent of flypaper. 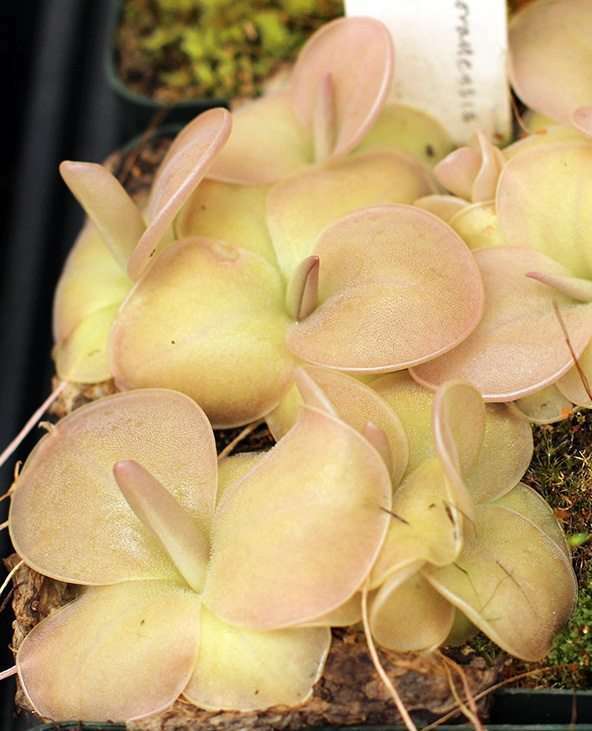 Commonly referred to as “pings” from their scientific name Pinguicula, this name means “little greasy one” in Latin. It is derived from their broad green leaves that are covered with tiny glandular hairs that secrete sticky mucilage, greasy to the touch. These drops of mucilage cause the leaves to shimmer in light – attracting peckish insects. You’ll find a small drop of glue at the end of each of the thousands of translucent hairs covering each Butterwort leaf. These drops shimmer in the sunlight, posing as an attractive meal for suckers… I mean insects. Thirsty bugs, are in for a nasty surprise.Bugs that land on the leaf become ensnared in the sticky drops of the surprisingly grippy mucilage. As the insect struggles, it comes into contact with yet more mucilage until it is saturated with glue. The lucky ones only loose a limb-or-two. Most are glued to the leaf surface and suffocate. These are a secondary set of concave glands that secret digestive enzymes in the presence of prey. A hopelessly stuck bug will be doused in digestive fluids, sometimes to the point of those fluids dripping down the side of a leaf. Soft tissues are turned into nutrient soup that the sessile glands then reabsorb.With bug corpses exposed on the leaf, you’d think that they would start to rot. The Pinguicula has a trick to prevent bacteria from harvesting its hard-earned food: a bactericide. These properties are so prominent, that northern Europeans applied Butterwort leaves to sores on cattle to encourage healing. 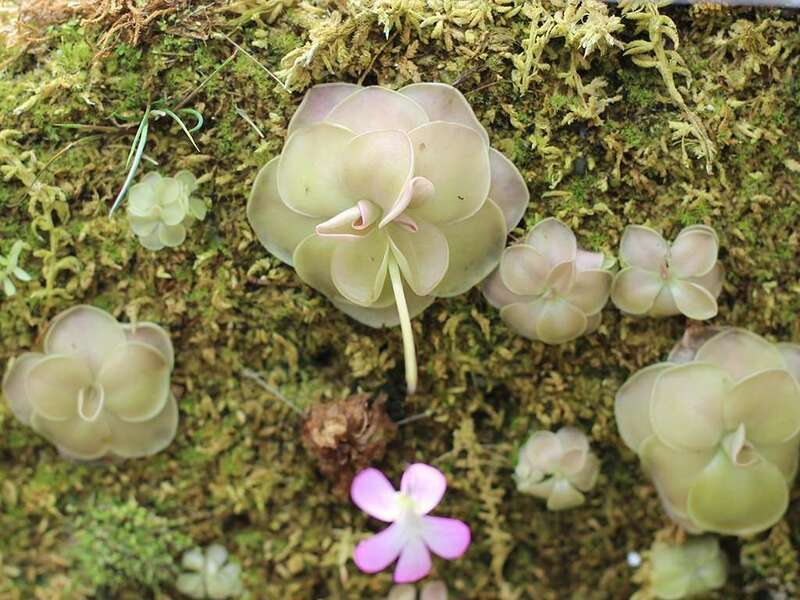 Some temperate Pinguicula can curl or fold their leaves. Movement is relatively slow, but over the span of a day, leaves with a meaty catch can fold to pool the digestive enzymes, preventing them from leaking off of the edge. This technique may also be employed to protect prey from being washed away in rain. Butterwort roots are usually sparse and shallow. However, the plants themselves are abundant and adaptable, growing in a great number of places from tropical countries to the Arctic. In general, they can be divided into three main categories, temperate Pinguicula, warm temperate Pinguicula, and tropical Pinguicula, which we’ll cover below. Temperate Pinguicula produce carnivorous growth and flowers during the warmer weather of spring in North America and Europe. Growing conditions stay sunny and wet, and you’ll find the plants in peaty soils, on cliffs among mosses, and growing alongside Sarracenia and Drosera.Cold temperate butterworts grow in more northern regions of North America, Asia, and parts of Europe including the United Kingdom. They are frequently found growing on calcareous cliffs and are built to survive harsh winters.Temperate Butterworts have a winter dormancy and survive the brutal cold by dying back to small nodes called hibernacula. Roots will also die back, allowing the hibernacula to be carried off and deposited in new locations by water. Gemmae, AKA brood bodies, AKA small genetic clones of the parent that detach, root, and grow new plants, will form along the base of the hibernacula and get scattered about as rainwater moves the plant. In cultivation, these can be harvested and propagated into new pings. Warm temperate Pinguicula grow year-round in permanently wet, acidic soils. Climate allows these butterworts to grow as perennials, living for a couple of years before dying. They enjoy ample sun, and grow alongside Dionaea (Venus flytraps) Sarracenia (North American pitcher plants), Drosera (Sundews), and Utricularia (Butterworts) in the southeastern coastal plains of the United States.There also exists European warm temperates, which include the annual/biannual P. lusitanica, and those from sect. Cardiophyllum (P. megaspilaea, P. crystallina, P. hirtiflora). The latter three grow in acidic bog areas to calcareous cliffsides. Like the American warm temperate pings, these species may experiences brief freezes during the night, but not enough to warrant the need for the adaptation of hibernacula (see temperate species, above).Because of their relatively short lifecycle, keep them in propagation or they’ll die out of your collection. Luckily, many have beautiful self-pollinating flowers that will help with this. The Caribbean and Central America host the largest diversity of Butterworts of any other location. A few decades ago, when botanists started poking around in Mexico, the number of known species jumped from 30 to over 90. Rather than growing in soggy bogs, many of these pings grow on gypsum cliffs and mossy tree trunks alongside succulents. Some grow epiphytically, physically growing on other live plants without doing serious harm to the host. You’ll even find species growing in the air, dangling from tree branches.Unlike other species, many Tropical Butterworts adapt to dry winters by transforming into succulents! They shed their carnivorous leaves for a tight rosette of harmless, water-retaining leaves. Like with other succulents, these leaves can be removed and used to root up new plants. 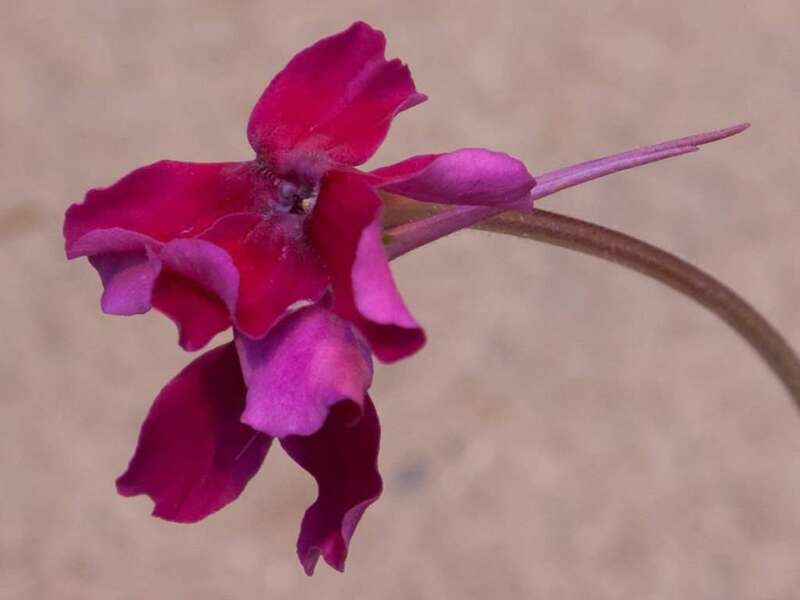 It’s during this time that they also send up big, beautiful flowers.There are a few Tropical Butterwort exceptions, here – Cuban Pinguicula do not form succulent leaves during winter months. They tend to act as annuals in the wild, and grow year-round in hot, humid conditions. They also tend to grow in rocky slopes or riverbanks, but also epiphytically in forested areas. The flashiest thing about Butterworts are their vibrant, colorful flowers. During respective flowering seasons, they send up volleys of individual flowers topping narrow stalks. If planted in close proximity, you will get a beautiful sea of violet, purple, pink, red, white, yellow and green flowers. Pinguicula flowers are cupped, funnel shaped, or flat faced with spurs that hang off the back of the petals. The petals themselves are frequently divided into two “lips” with the top lip containing two lobes, and the bottom lip containing three lobes. Looking at the flower straight-on, you’ll be staring down the funnel-shaped spur which is covered in hairs, called beards. 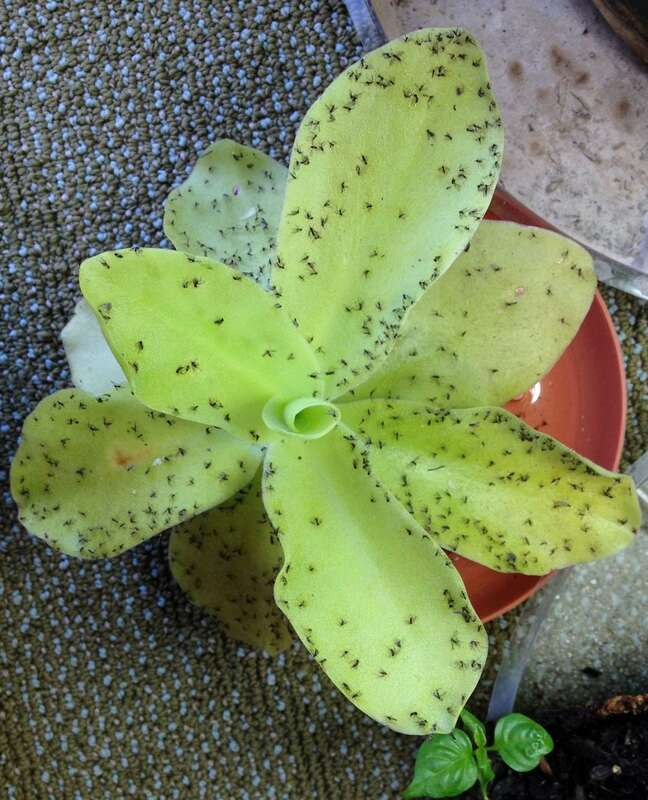 Most Pinguicula require hand-pollination, especially when grown indoors. The flowers are designed for pollination by long-tongued pollinators like hummingbirds and butterflies. The flicking action of long tongues shuffles around the pollen needed to pollinate. 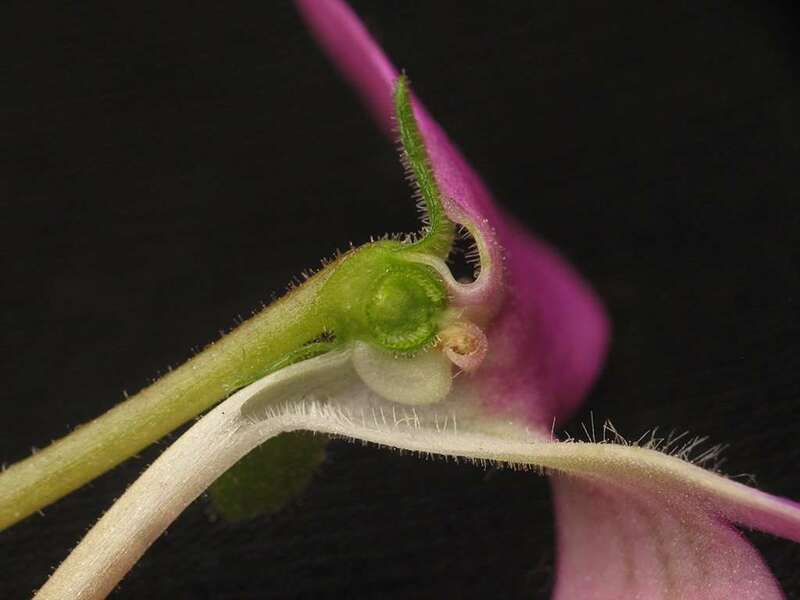 A handful of species like P. lusitanica, P. villosa, P. chilensis and P. antarctica will self-pollinate without assistance.Looking down the “throat” of the flower, you’ll first see a small apron-like pad on the ceiling – the stigma. Behind this, tucked out of view are the male anthers. To collect pollen, gently insert a toothpick or small paintbrush past the stigma, swipe upwards, and withdraw. Examine your toothpick looking for pollen gains. If you managed to snag some, reinsert the toothpick, dabbing it onto the front-facing stigma. 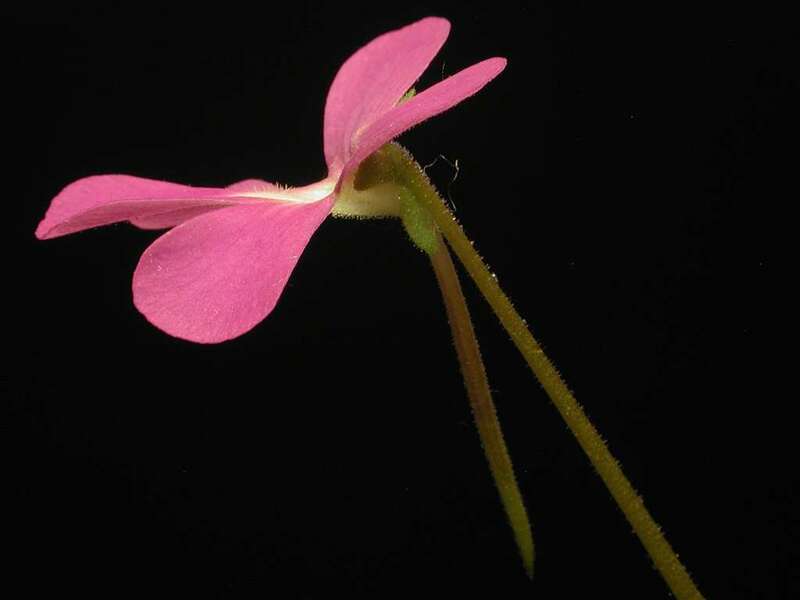 This method can be used to cross-pollinate Pinguicula, as well – simply transfer the pollen to another plant’s stigma without jostling any of that flower’s pollen loose. A few days after pollination, the petals will fall off. Over the next weeks, the seedpod will swell, brown, and split open. Seeds are tiny, numerous, and should be collected immediately and sown quickly. Viability is only a few months if stored in the refrigerator. Mr. Marshall contacted Charles Darwin in the early 1870s to let him know that tiny insects were dying at the hands of a collection of Butterworts in England. Upon investigating, Darwin discovered that, in fact, these plants were purposefully catching prey for the purposes of digestion. In the 1960s S. Jost Caspar accumulated all known Butterwort genus information up until that point in a large monograph. Upon the Berlin Wall falling in the late 1980s, Herr Caspar, a botanist from East Germany, was surprised that Butterworts had become common windowsill plants in the outside world. In recent times, Dr. Donald Schnell and Jurg Steiger have documented new information on Pinguicula. Pinguicula species number nearly 100, and grow in diverse locals around the planet. Home ranges from the Arctic Circle down through Siberia, Europe, and North America. They max out in Mexico, where you’ll find the most numerous and grand species. Some species continue down through South America. Mexican Butterworts and tropical Butterworts thrive in equal parts perlite, sand, pumice and/or lava rock, and peat. Warm temperate Butterworts are easier with one part sand to one part peat. Temperate Butterworts prefer two parts peat, one part perlite, and one part sand. Use three to four inch drained pots of glazed ceramic or plastic. Because Pinguicula have a shallow root system, the pots can be similarly shallow.Some warm temperate species perform well in undrained pots. Just make sure the soil doesn’t stay soaked, nor dry out.Mexican Butterworts can be planted in chunks lava rock or abalone shells for showier displays. Keep warm temperate and temperate Butterworts permanently wet using overhead watering and watering trays. Temperate Pinguicula enjoy cold water. This method also works for Mexican Pinguicula, but soil needs to be kept drier during the winter when leaves turn succulent.Use distilled or reverse osmosis water. This can be inexpensively purchased in most grocery stores, or you can invest in a reverse osmosis (RO) filtration system that hooks up to a sink (bonus – this also provides great drinking water for humans and pets). Butterworts enjoy very bright light, but avoid cooking temperate pings with direct sun. Outdoors, Butterworts catch small springtails and gnats. 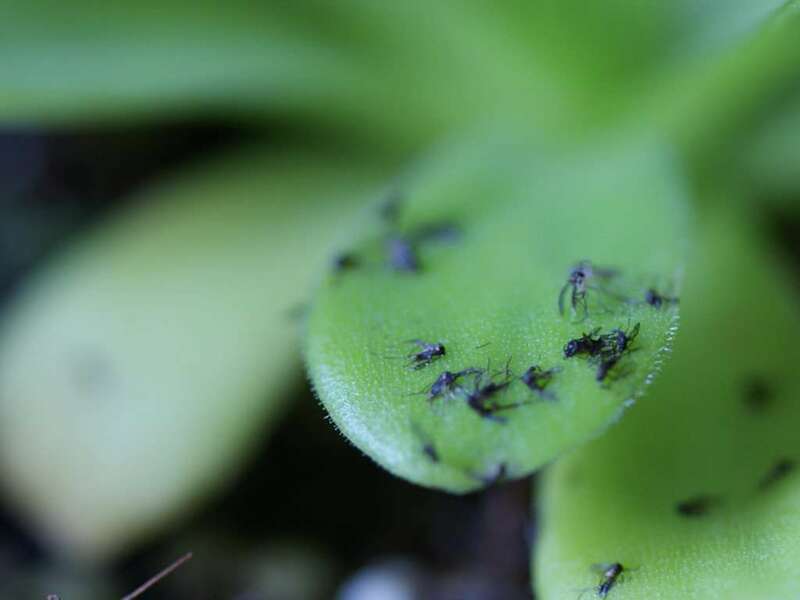 You can feed indoor plants small ants or wingless fruit flies (can be found at pet stores). If feeding live insects isn’t your thing, you can use small parts of dried insects that can be found at pet food stores (lizard food). Generally avoid fertilizing. Remember, these plants grow naturally in nutrient poor soils – a major reason why they evolved traps to catch insects as their source of nutrients. Fertilizing can burn Butterwort roots, leaves, and flowers and can easily kill the plant.Some advanced growers use an extremely diluted epiphytic, orchid, or Maxsea fertilizer to foliar-feed plants (applying it only to the leaves of the plant), but this is risky for a beginner and not recommended. If you do decide to fertilize your pings, avoid getting any in the soil or on the flowers. Acid fertilizers will kill Mexican Butterworts, so avoid all-together. A transplantation into fresh soil every two or three years will promote healthy growth. Soak the root system in SUPERthrive to ease stress and encourage new root growth.As with most carnivorous plants, avoid transplantations during the growing season. Transplant temperate, warm temperate, Caribbean, and Mexican Butterworts in late winter. Mexican pings should be towards the end of succulent growth and dormancy. Divide and propagate temperate Pinguicula gemmae during this same period. Butterworts don’t frequently produce offshoots that can be divided into new plants. However, temperate species do produce gemmae around the base of the main growth point during their dormancy period. They are small clumping sprouts that appear cone-shaped.Pinguicula gemmae can be removed from the main plant and placed pointed-side-up on the plant’s usual soil mix. When weather warms and days grow longer, the gemmae will root up and produce mature Pinguicula by the end of the first growing season. Succulent leaves of Mexican Pinguicula can be harvested during winter dormancy months and used for propagation. Use forceps to gently pluck these leaves from the parent plant. Avoid grasping leaves hard as it will cause bruising and lower take rates. You can harvest up to half of these leaves without injuring the parent plant.Simply lay the succulent Pinguicula leaves right-side-up on the preferred growing medium – no need to bury them. Maintaining soil moisture and higher humidity is easily accomplished in an enclosed seed tray. Conditions should be bright, but out of direct sunlight. Remove any leaves that begin to turn brown or rot.Within several weeks to a couple of months, plant buds will start to form and roots will emerge from the bottom of the leaf. After a few months, plants will be rooted up and can be transplanted into a more permanent pot. See the section above for Pinguicula flower anatomy and pollination techniques. The sooner that seed can be sewn, the better, as viability is only a few months even if stored in a refrigerator.Germination is accomplished by sparsely sewing seed onto the specie’s preferred soil mix and keeping conditions humid and bright for a few weeks. Use a seed tray for best results. Butterworts aren’t known for taking well in vitro. Mercifully, Butterwort pests are rare. Snails and slugs can do sparse damage, but it’s normally not life-threatening. Pyrethrin insecticides can be used if aphids latch onto the undersides of leaves. Flea collars can be used to preemptively deter pests. Dicolfol can be used to treat the rare mite infestation.Fungus will attack pings in high humidity with low air circulation. To treat, adjust your growing conditions, and apply a fungicide. See above “sub-soil biology and growing conditions” section for preferred climatic conditions for tropical, warm temperate, and temperate Butterworts.Mexican Butterworts require drier, cooler dormancy periods during winter and can generally survive temperature dips into the 40°s Fahrenheit. During the summer growing season, lows around 60°F are acceptable. Outdoor Butterwort growing success will be dependent on the type of ping you’re growing and if your climate matches their natural conditions. Some Mexican species with drier winter requirements are best brought indoors and placed in windowsills during dormancy. In general, Butterworts do well in greenhouses. Mexican Pinguicula do best in warm or hothouses. Warm temperate Pinguicula do well in cool and warm houses. Temperate Pinguicula enjoy in cold houses, cool houses, and warm houses if kept cool during winter months.Avoid direct sun in glass greenhouses – use shadecloth or a light-diffusing plastic. Mexican butterworts do great under florescent or LED grow lights. Remember to account for winter dormancy conditions.Some temperate Pinguicula do well in terrariums.Avoid tackling temperates in terrariums – total trouble. Mexican Butterworts are ideal windowsill plants with their diffused light preferences, low humidity requirements, and propensity to devour small house pests, like gnats. Their flowers make beautiful house decoration, and, in general, the plants make great conversation pieces when you have house guests.Hearty warm temperate species can do well in windowsills. Temperate species will not perform well in windowsills. Warm temperate and temperate Pinguicula will do well in bog gardens when outdoor climate matches their natural conditions. Try avoiding direct sun by planting them in the shade of Sarracenia – natural carnivorous companions. The most popular butterwort in cultivation, Pinguicula moranensis is easy to care for and makes a great candidate for windowsill and terrarium growing. It's a handsome ping and highly variable, as far a butterworts are concerned. You say "gigantea," I say "gigantic." 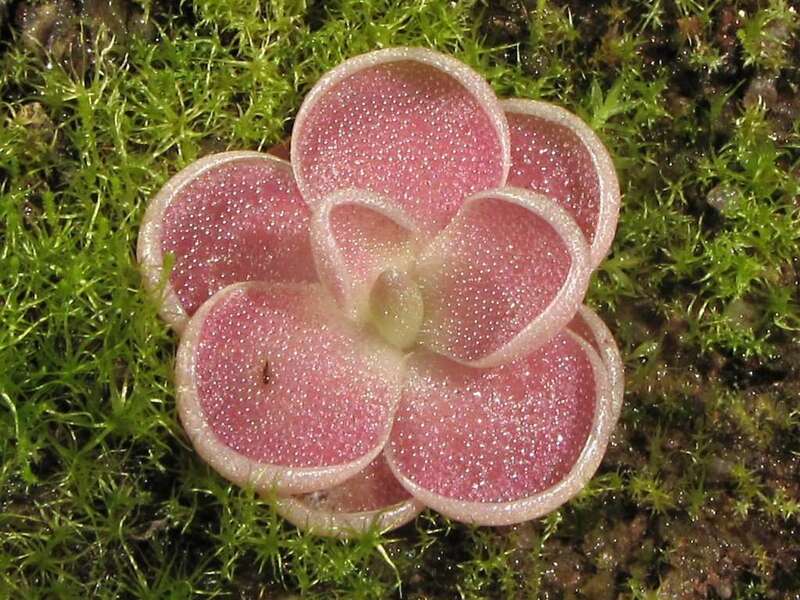 Pinguicula gigantea lives up to its name as the largest known Mexican butterwort with a diameter of around one foot. This ping is easy-growing, and does well outdoors at the author's Northern California residence.